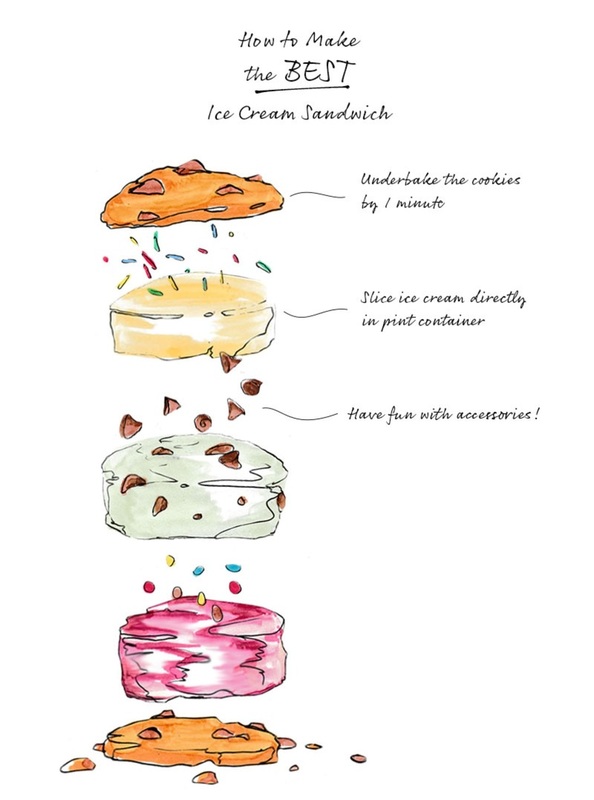 I'm all for an elaborate ice cream sundae or even a classic vanilla cone, but when it really comes down to it, ice cream cookie sandwiches are my most oft-craved frozen desserts. Whether you're talking about a classic chocolate chip-vanilla combo or a more elaborate, colorful mix of flavors, these desserts are pretty much perfect. When it comes to desserts, I'm usually a totally-from-scratch person. I will take the time to make my pie crusts by hand with real butter and I don't shy from elaborate cakes. But when it comes to ice cream sandwiches, I do allow for a concession: the ice cream. Yes, I do know how to make ice cream myself. And yes, sometimes it is better than storebought. However, there are plenty of great, national ice cream brands that will work just fine. (I like classic vanilla from Haagen Daaz.) While you're shopping, you'll also want to pick up any toppings/accessories you'd like to use — mini chocolate chips and sprinkles are great, and, let's be real, not easily made at home. Sugar cookies, snickerdoodles, death-by-chocolate, chocolate chip and even pinwheels make excellent ice cream sandwich cookies. But regardless of your recipe, you'll want to take the same step every time you bake cookies for this task: underbake them. Not by too much — we're talking just a minute or so. This step will ensure that the frozen cookies will still stay soft enough to bite once dessert time rolls around. And even before those cookies hit the oven, make sure you're making them oversized (if you don't do that on the regular). Aim for the baked cookies to be about the same diameter of a pint container of ice cream (see below). One other tip: Make sure to let the cookies cool completely before assembly. But you knew that, right? The hardest part, in my opinion, of building an ice cream cookie sandwich is how to get hard, frozen ice cream spread evenly across the cookies without everything turning to a soupy mess. If you're using the semi-homemade method, as I recommend, you're already at an advantage. Just purchase your ice cream by the pint, and when it comes time to assemble, use a bread knife to slice 1-inch-thick (or thicker!) ice cream rounds through the pint container. Then all you need to do is pull off the cardboard and sandwich your perfect ice cream round between two underbaked cookies. Finally, add some color and flavor with additional accessories. I like to smush them into the sides of the ice cream round, but you can also try layering them in the middle, as long as you leave room for some of the ice cream to stick to the cookies. Sprinkles and chocolate chips, as mentioned above, are classic additions, but things like dehydrated strawberries (grab a bag from Trader Joe's) will add some color and sweetness, and toasted nuts provide excellent crunchy contrast to the soft cream and cookies. Once your sandwiches are assembled as you'd like, wrap them well in parchment paper and then freeze 'em for at least an hour to let all of your layers get to know each other. Then it's dessert time!